On Monday, the St. Kitts and Nevis Police Force received a new tool to utilize in ongoing efforts to reduce crime, in particular, illegal narcotics. 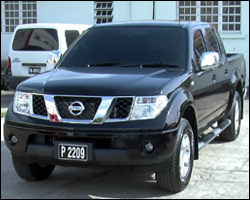 Director of the Narcotics Affairs Section of the United States Embassy, Kurt van der Walde, presented Commissioner of Police Celvin G. Walwyn with keys to a new Nissan Navara to be used by members of the Drug Eradication Programme in the Nevis Division. During a brief handover ceremony, Mr. Van der Walde noted that the donation symbolizes the concrete support of the United States Government to the people of St. Kitts and Nevis and is in keeping with the objectives of the Caribbean Basin Security Initiative (CBSI) – President Barack Obamaâ€™s signature project designed to deepen regional cooperation and combat the drug trade and other transnational crime. In response, Commissioner Walwyn thanked the U.S. Government for the donation and noted that the vehicle will make a positive contribution to the drug eradication programme. â€œWe need equipment, we have been given a car and I can guarantee you that this will be used for that purpose and we will do everything we can to (advance) the fight to retake our streets,â€ the police head stressed, noting that the effort extends from neighbourhoods to the hills. Well st kitts & nevis don’t need a pick-up from the US to take back the streets. What a load of bull crap they should stop looking up to the US and other nation for free stuff.